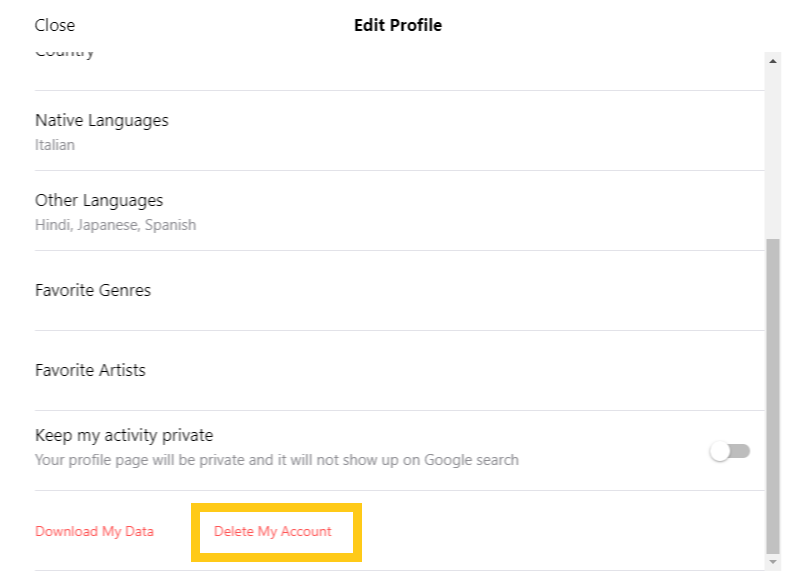 To delete your account, you have to use the website version of Musixmatch. - Tap on "Edit profile"
- Select "Delete My Account"
Please note: an account cannot be deleted through our iOS or Android apps. Your account will be closed and you won’t be able to log in anymore. All your Musixmatch activities on your account will be removed. This includes removing your badges and rankings on all Leaderboards. Favorites and identified songs you have created will be lost. We will send you a confirmation email that contains a link to reactivate your account in case you change your mind. This link is only valid for 7 days, after that time your account is lost forever. If you want to, you can create a new account. Please note: You can unsubscribe from emails or hide your profile from search engines without deleting your account.